[New for 2015] I'll admit it, when I saw all three new core flavors in front of me, I wanted them all. 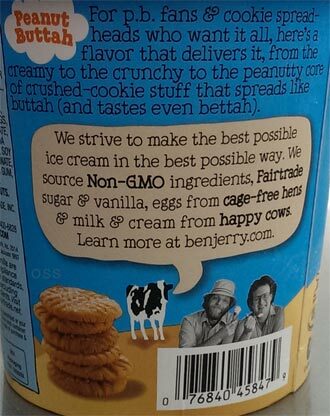 How can you not want to be one of the first to just sit in front of these glorious sounding creations that have cookie butter cores? I am beyond stoked.... must keep calm and realistic.... let's pick the one I can't bring home. I was expecting to see more of the core on the opening shot, but no matter because it smells awesome! Mmmmmmm. Do I aim for the core or the bits? There's the core, and it is.... still pretty solid actually. Ok, I'm trying to scoop some. It's fairly dry, but still a mode of peanut butter creaminess to it. It's kind of like... I don't know, a peanut butter sugary thing of some sort. I'm trying to dig further but it's fairly solid and I am so afraid I'm going to wear this. 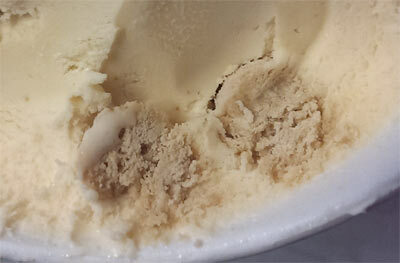 [side note: don't forget to notice how dense the ice cream is]. Oh boy, found some cookies! They're about pea size and fairly dry. The little bits are indeed crunchy but seem somewhat lost amongst such a busy pint. I know this will vary from pint to pint, but I expected tons of bits and a few cookies but got a crazy ton of cookies and then scattered bits. (not complaining per say, just observing). Ok, this is pretty filling, so I'm going to take a break.... right after this huge bite of core.... I want to say it has a bit of a floury vibe to it. 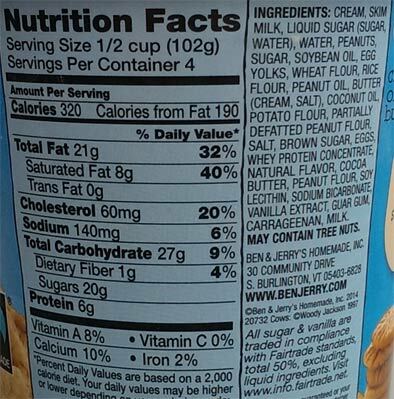 It's definitely not a straight cookie butter like I am use to, it's denser (more solid) than that. Why do I have such trouble describing things sometimes? And that's that for the first scooping. Now keep in mind my pint seemed a little dried out, so your mileage may vary a bit. Hopefully your core will be a little easier to scoop so you can get a true blend of ingredients on your spoon. 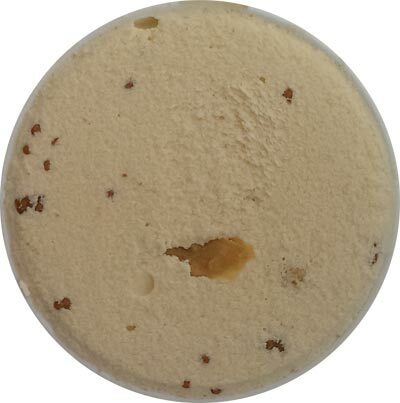 For example, a scoop of cookie core with a bunch of peanut butter bits? That was tons of fun. Wait, I had a thought tonight before posting. Remember how I griped that scotchy scotch scotch was just too much? I wasn't alone, and I'm wondering if they kept that in mind when developing these. Or to put it another way, remember how I was surprised how mature/reserved B&J Cotton Candy was? I think that's happening here too. They've avoid a super sweet core in favor of something more mild and pleasant. I can't say I'm in love with it just yet, partially because I do have such a sweet tooth, but I see where they were going. If you try this one, please let me know how the core experience is for you. I'll be headed back next week to try the other flavors if I can't find them closer to home this weekend. On Second Scoop: Ok, couple of quick points. 1, I didnt even really notice the sugar bits. 2, I may have plowed through the cookie bits as well. There's a lot of peanut butter here and it just didn't pop for me personally. Like every core flavor, it'll have a big fan base, it just didnt wow me. The core just didn't sell it the way I wanted to. Note: Parts of Europe have Utter Peanut Butter Clutter which appears to be the same flavor minus the sugar bits. 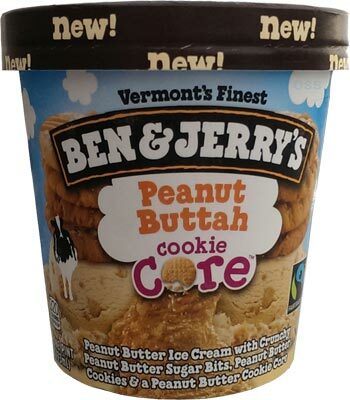 The Peanut Butter Cookie Core had an odd taste to me, like something was off. But The rest of the pint was PB overload aka delicious. After searching at Publix and Winn Dixie, I finally found them at a Super Target in Orlando, FL. I bought the Speculoos one... absolutely amazing. Needless to say it's already gone. Not exactly your most articulate review. Can't really tell if you liked it or not. yeah, my words are like my thoughts, a little muddled, I'm not positive how I feel about this one yet. It's not bad, but it wasn't an instant slam dunk like some of their other flavors. I'm going to try the other cores first and then re-scoop this one in the next few days. Absolutely delicious!!! I recommend leaving it on the counter and letting it soften up before indulging..it makes a world of difference!! I just tried this flavour today and I think I wish it was the same but without the core. The core had an odd mouthfeel. It's just a little off. I liked everything about this flavour except for the core. So far I haven't liked any of the core line of ice creams, and I suspect that I'm not going to like any of these cookie core ice creams. Sad. On the other hand, peanut butter half baked was THE best! I ate two pints within a few days because I just couldn't stop. Where have you been all my life!?! I just came across this for first time last night. It's a new fav! 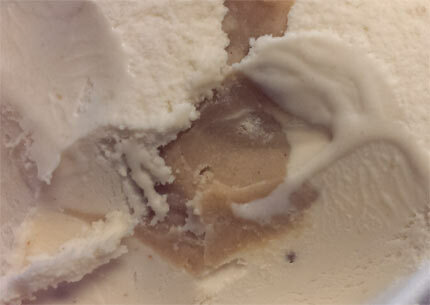 I used to get the Tonight Dough solely for the occasional piece of peanut butter cookie dough. This is way better! 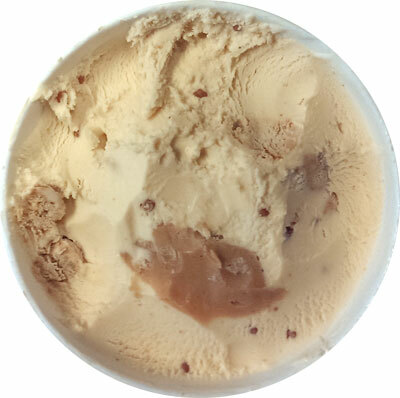 Don't know why I am on the internet looking at ice cream reviews, but YOLO. I basically AM peanut butter. Shakes, sandwhiches, the whole nine. This flavor was $2.51 here in Seattle on closeout. I bought one, ABSOLUTELY LOVED IT, but now they are all gone. I will do nothing else in my life until I find another one. Do this many people really chat about ice cream on the interweb?